Alcova Heights was given its name by real estate developer J. Cloyd Byars. “Alcova” stands for Alexandria County, Virginia. In 1921, Byars bought 142 acres from the Columbia Land Company and sold the lots for five cents a square foot. Byars laid out many streets, naming them Azalea Street (Quincy Street), Marconi Avenue (8th Street), Deepwood Avenue (9th Street), Springhill Street (Lincoln Street), Virginia Street (Monroe Street), and Linden Avenue (Oakland Street). Byars’ home, which he also called Alcova, is the oldest in this community. It was built before the Civil War as a tenant farmhouse on the estate of William Young, who had bought the property in 1850. During the Civil War, Alcova, also known as “Spring Hill Farm” and “Columbia Place”, was occupied by Union soldiers and many buildings were destroyed. For “military purposes” all the fences were taken down, the animals confiscated and the main house burned. In 1878, the Young family received $3,198 in compensation for these losses. The Alcova house has undergone many changes over the years, and is now a County landmark. By the time that Mr. Byars began developing the neighborhood, the population of the whole County was rapidly increasing and Alcova Heights became a popular spot to live. The trolley line was less than a mile from “Hunter’s Crossroads”, the intersection of Columbia Pike and Glebe Road. Telephone service had reached the community, and after 1928 water and sewer services were available. Alcova Heights in 1921 was regarded as a very accessible community. It was bordered by two surfaced highways, Columbia Pike and Glebe Road. Trolley service to Washington, Rosslyn, and Alexandria was available less than a mile down Columbia Pike, at the intersection with what is now Walter Reed Drive. Transportation was further improved when Bob May and his wife started a bus service – consisting of one bus and one driver, Mr. May – operating between their home in Barcroft and Washington. It was known as the Columbia Pike Bus Line, and the first Barcroft-to-Washington trip was made June 21, 1921. In 1924 service from Washington to Alexandria was added and the line became the AB&W Rapid Transit Company. The nearest elementary school in the early 1920s was Columbia, located on Columbia Pike at Walter Reed Drive. 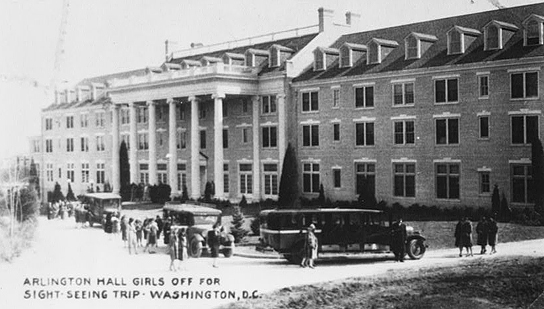 For “higher education,” students traveled to Washington, until the opening of Thomas Jefferson Junior High School and Washington-Lee Senior High School in 1925. Arlington Hall, now the site of the State Department Arlington Hall, was built in the 1920s as a select school for girls, Swidells Junior College. It went bankrupt in 1930, but managed to keep going until the Army took over the rural campus in the 1940s. The first headquarters of the Defense Intelligence Agency was in this installation. Many of the homes of Alcova Heights are built on the former grounds of this old institution. Most of the single family homes in Alcova Heights were built between 1921 and 1950. There are least two Sears houses among them. Over the past 50 years, a number of additional single family homes have been added through infill development. The Dundree Knolls townhouse condominium along Columbia Pike was constructed in the mid-1980s. On January 21, 1966, the Alcova Heights Citizens Association was organized. Until this time, Alcova Heights had been included in the territory of the Columbia Pike Citizens Association. There were 80 Charter members and Dr. Mosely served as the first President. Throughout its history, Alcova Heights has been a popular place to live, because of its relatively inexpensive homes, large lots, easy access and recreational amenities such as Alcova Heights Park. These same factors are at work today ensuring that it remains so.